The Bhopal Lok Sabha seat, which has over 18 lakh voters, including 4.5 lakh Muslim voters, will go to the polls on May 12. With Thakur joining the fray, the Bhopal Lok Sabha seat is poised to witness a gripping contest in a constituency that has been a saffron bastion for nearly three decades. Congress has not won Bhopal Lok Sabha seat since 1989. The Bhopal Lok Sabha seat, which has a sizable Muslim population, will go to the polls on May 12. 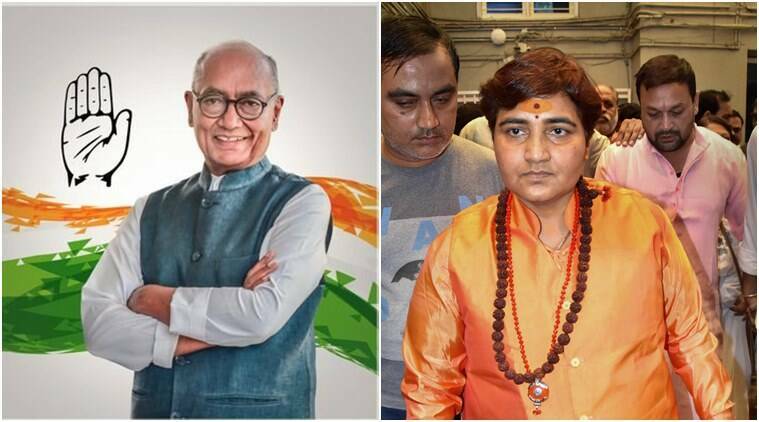 Thakur, an accused in the Malegaon blast case who is currently out on bail, will be seeking to settle old scores with Singh who, she alleged, conspired to get her falsely implicated in the 2008 Malegaon blast case. She had described Singh as an “anti-Hindu leader who called Hindus terrorists”. She had also claimed that allegations against her resulted from a conspiracy hatched by the then Congress government at the Centre and that torture by Anti-Terrorism Squad had broken her physically and mentally but added that her soul was intact. In 2017, a special NIA court had dropped the stringent Maharashtra Control of Organised Crime Act (MCOCA) charges against Thakur and others in the Malegaon blast case, which left six persons dead and 101 injured. She, however, still faces trial under other criminal provisions. The candidature of Thakur assumes significance as it comes at a time when the upper echelons of the BJP have accused the opposition party of coining the “Hindu terror” phrase and slapping “false” terror cases on Hindutva activists when the UPA was in power.